This is probably the most powerful book I've read in a long time, and it's definitely one of those books that will end up on my Recommended Books list. 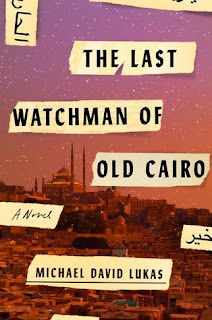 The Last Watchman Of Old Cairo is a story about culture and history, and the people that are participating in making and protecting them. The story is told from three different story-lines: the first one tells the story of Ali, a Muslim boy who becomes the first watchman of the Ibn-Ezra synagogue in old Cairo; the second one tells the story of twins Agnes and Margaret Smith and how they retrieve some of the documents from the synagogue back in the 1800s; the last one tells the story of Joseph, a young man on a quest to understand his late father and, ultimately, himself. At first I had a hard time navigating the three story lines. Although it was clear what the connecting thread was, I wanted to stay more in one story line than in the other. When I got used to the pace and to the abrupt change in scenery, I found it easier to just let the story take me wherever it was going to take me. And let me tell you, what a journey. The thing I liked most about this book was that we get to see how different moments in time define the same artifact: in Ali's time magic was the way to describe one of the most important documents in the Geniza, while the sisters saw it as an important piece of history, and in Joseph's time it was thought of as something forgotten and almost a part of a myth more than reality. I was reminded about my love of history while reading the book, especially since the story at one point, through Ali's eyes, shows us a piece of history as it was being made, which I found fascinating. We also get to see how one's choices influence a child's life. On his quest to understand the parcel he received after his father's death, Joseph discovers more about his parents' relationship, how they met, how they fell in love, why they didn't stay together, and at one point I really wondered how his life would have looked like had he been raised by his father or by both his parents. Would he have grown up to become the next watchman of the Ibn-Ezra Synagogue? Would he have had the mission to protect its secrets? In a way though, he did end up being a sort of watchman for the documents retrieved by the twins from the synagogue so many years ago, so I guess in the end his life did lead him down that road, just slightly different than the one Ali's descendants had to navigate for centuries. The pace is definitely slower than what I normally read, but the story kind of mesmerized me and I lost myself into it, into stories of duty, forgiveness, love, and culture. I absolutely loved this story and I definitely recommend it. I was excited seeing you've read this title - when I first heard about it, I was smitten! I must admit, I never quite realised how properly addicted I am to reading Historical Fiction til I started blogging my reading life! The way you described your journey 'through the story' itself is why I feel like a time traveller whilst reading Historical narratives! The multiple perspectives can be tricky, esp if it shifts in/out at a pace you felt might be too abrupt to leave in exchange for the next. I've read stories like that - where you feel partial to one of the time-lines or you feel you've become short-changed without enough time in the other one. It seems like the story found it's feet, gaining traction as you read - as you mentioned you released trying to foresee where the direction was heading and just let the flow of how it was writ sweep you in it's arms. Sometimes that's hard to do... so I appreciate this insight in case I'm able to get closer in queue from the library! I will definitely return after I've read this!